That statement by Quinnipiac men’s ice hockey head coach Rand Pecknold sums up the final 20 minutes for the Bobcats in their game two quarterfinal loss to No. 8 Brown in Hamden on Saturday night. The 4-3 loss knocks No. 1 Quinnipiac out of the ECAC Hockey playoffs and marks the first time Quinnipiac has lost a home playoff series. Quinnipiac held a 2-0 lead going into the final period of play. The team was 20 minutes away from forcing a game three on Sunday afternoon to determine who would be going to Lake Placid, New York to play in the semifinals. Brown had other ideas on deciding who will be going to upstate New York. The Bears scored two quick goals in the opening minute and a half to tie the game, thanks to tallies from the two captains. Senior defenseman Max Gottlieb beat Quinnipiac junior goaltender Andrew Shortridge with a shot blocker side 1:22 into the period. Then 32 seconds later, senior forward Tommy Marchin jammed home a rebound to knot the game at two. Around the midway point of the period, Brown junior forward Brent Beaudoin found himself on a breakaway and made no mistake of the chance to give Brown the lead, firing one past Shortridge on his blocker side. It was then less than two minutes later that Marchin notched his second goal of the game with a shot off the faceoff that extended Brown’s lead to 4-2. The Bobcats had a late rally, as senior forward Craig Martin was able to deflect a shot from the point past Brown junior goaltender Gavin Nieto to cut the lead to one. 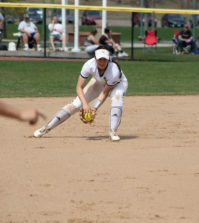 But Quinnipiac’s push was too little, too late, and Brown completed the sweep of the top-ranked Bobcats. Quinnipiac received two goals from junior Alex Whelan in the first period to give the team that lead, and had a multitude of other chances to score. But Nieto and the Brown defense came up huge when it was needed most. Quinnipiac struggled mightily at home on Saturdays all year. On the second night of back-to-back games in Hamden, the Bobcats went 1-5-1 on the season, including this loss to Brown. 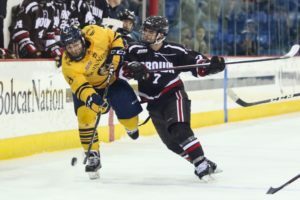 Brown defeated Quinnipiac three times this season in Hamden, and as for these last two games, it could be chalked up to Quinnipiac straying from its identity, according to Pecknold. The season is not over for Quinnipiac. Given how well it did in the regular season, Quinnipiac came into the playoffs ranked at No. 5 nationally and this loss should not drop the team out of the top 16. In addition, senior defenseman and captain Chase Priskie will be able to return to the team for the tournament after having to sit out the two games this weekend. Not having Priskie certainly hurt the team, but Pecknold said the team did it to itself. The NCAA Division I men’s ice hockey championship bracket will be announced on Sunday, March 24 at 6:30 p.m. Quinnipiac will learn of its fate on that date.